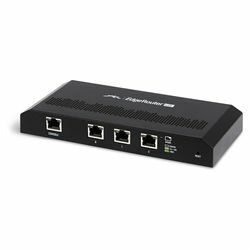 Housed in a compact, fanless form factor, the EdgeRouter Lite operates quietly as it delivers the powerful routing, security, and management features you require to efficiently run your network. Each Gigabit port functions as an independent interface, allowing you to configure Virtual Local Area Networks as your network segmentation requires. Set up multiple DHCP servers, easily control dynamic and static IP addressing, and conveniently track network activity and devices with multiple monitoring tools. Includes AC adapter and mounting screws. Cons: Requires network experience to correctly program. Best configured using the command line interface. Other Thoughts: If you are inexperienced with CLI router configurations, the Ubiquiti forums offer friendly advice.